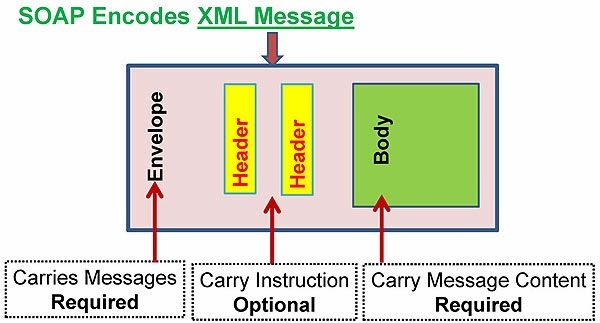 Simple Object Access Protocol (SOAP) is an XML-based protocol used for exchanging information in a decentralized and distributed environment using XML, is a standard developed by the W3C. 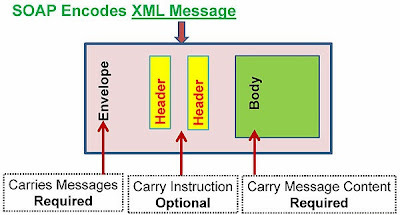 The basic structure of a SOAP message consists of a header and a body, both of which the contents are application specific, i.e. not defined by SOAP. The differentiation is made to distinguish information that is to be processed by all intermediaries (Header) and information that is to be processed at the final destination (Body). Fault (optional) – errors that occurred while processing message. Fault Elements also contains sub elements.